Traveler Reviews for Private Tour in Sankt-Peterburg, Sankt-Peterburg, Russia by Tour Guide Dasha D.
About Dasha D. Message Dasha D.
the service was excellent and we had a great tour-she really know how to make maximum use of our time and was very flexible to our requirements.I am convinced this is the best way to see everything in the limited time of two days-she minimised queues and allowed us to view all of the important things at a pace to suit us. On a personal level Dasha had excellent English,and was very articulate and had excellent knowledge-all four of us were very pleased and parted with a degree of sadness.Well done Dasha. Dasha is a great tour guide. She was the best guide we had on our Baltic trip. She is very precise, attends to detail, very knowledgeable and very friendly. Getting us around to all the things we wanted to see over three days was difficult but she was able to do this expertly. We especially were impressed with her thoughtful planning getting us to many sites before large crowds arrived. We especially enjoyed her knowledge of past and current Russian history. The 3 lunches showed us Russian cuisine nicely. We really have a wonderful time in St. Petersburg tour, our Guide Dasha was excellent. We saved a lot of time and got shortcuts to the main Museums and attractions, specially because we were on the FIFA Soccer World Cup and there were long lines on the Museums and attractions. Our guide, was very knowledge and explain us about Russian history very well. TOUR GUIDE RESPONSE: Dear Doug, Thank you so much! It was a big pleasure to guide you. I hope your dream came true. Come again and take care. Best, Dasha. Our group of three middle aged had an excellent tour with Dasha. She was a wealth of knowledge, flexible, and gave us a little insight into life in St Petersburg. The transport she arranged worked perfectly. She always managed to dodge the very long ques of the big cruise boat tour groups. We came into St Petersburg on a cruise ship and the customs arrangements were exactly as she described in advance. I recommend Dasha without hesitation. TOUR GUIDE RESPONSE: Thank you Randall! It is very important to me to show you wonderful sights of the city from its best side. I also enjoyed our trip and hope to see you again! Take care, Dasha. Dasha was young, knowledgeable and enthusiastic about her city. We loved the lunches at local restaurants and the visit to the subway. Overall the logistics went smoothly. The advantage of being a small group is that while the large groups met at 8am, we met at 9am and there were no lines at Visa control. Also we were able to move the museums, etc. more efficiently. Dasha was very knowledgeable, friendly and flexible. She provided us with the van we requested and a driver. Dasha was excellent! We had 6 people over 3 generations (age 6 to 75) and she managed all of our attention spans. She was well educated on Russian history and provided interesting insight everywhere we went. We definitely recommend Dasha. TOUR GUIDE RESPONSE: Thank you very much, Dan for coming and for your pleasant comment! I was very happy to spend time with your wonderful and cheerful company! TOUR GUIDE RESPONSE: Thanks Mark! 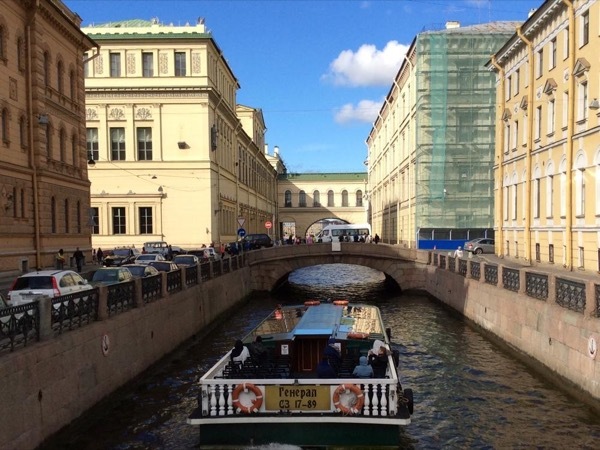 Our 2 day stay in Saint Petersburg was exemplary due to Dasha's insight and and touring capability. I would highly recommend her to anyone seeking a guide in this area. She makes the tour quite interesting and does exactly what you want to see while adding important places to visit. We had an excellent experience. Dasha is very knowledgeable and provided us a lot of information about Russian history. We had a great two day visit to Saint Petersbourg. TOUR GUIDE RESPONSE: Thats guys, I spent great time with you! Fue genial! Dasha made a great experience an unforgettable one for my family. We had a 9 year old boy with us and she took great care to make sure there was a balance of things to see and do. Dasha was very attentive, on time, professional, well versed but most of all had a great personality that makes me proud to now call her a friend. Dasha is a fantastic tour guide. Her English is excellent! She knows the best sights to see in Saint Petersburg, and knows the Russian history. We thoroughly enjoyed our day tour in St Petersburg with Dasha, she was on time, and very thorough and knowledgeable. I definitely recommend Dasha as your tour guide when you visit St. Petersburg. TOUR GUIDE RESPONSE: Dear Patricia, Thank you for coming and bringing your family to St-Petersburg! I had wonderful time with you. Take care, Dasha.